UGLY KID JOE, who are currently working on their first new, full-length in nearly 20 years titled Uglier Than They Used Ta Be, have launched a PledgeMusic campaign. You can check it out right HERE. While you're there check out some of the very cool items on offer including a chance to get your name in the liner notes of the new album, a chance to meet the band and hangout on their UK tour in September and you can even buy some hand written lyric sheets, signed Cds and killer vinyl! 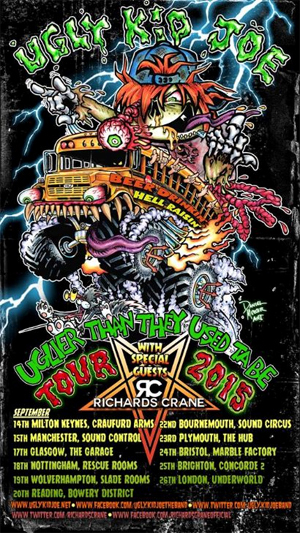 UGLY KID JOE will also be touring The UK in September with the RICHARDS/CRANE as special guests. RICHARDS/CRANE is an acoustic project featuring UGLY KID JOE vocalist Whitfield Crane and original GODSMACK guitarist Lee Richards. The duo has also issued a video for their debut single, "Black & White". It features cameos from: Snake (SKID ROW), Ginger Wildheart, Andy Copping, Chris Jericho (FOZZY), Chris Catalyst (EUREKA MACHINES), Michael Starr & Satchel (STEEL PANTHER), Benji Webbe (SKINDRED), Phil Anselmo (DOWN), Dee Snider (TWISTED SISTER), CROSSFAITH, Myles Kennedy (ALTER BRIDGE/SLASH), CJ Wildheart, Mikey Demus (SKINDRED) and Dan Devita (TKO). Check out the video right HERE.